The redesigned 2018 Audi A5 is fitted with a 252 hp, 273 lb-ft 2.0-liter turbocharged engine, it features all—wheel drive and a 7-speed dual-clutch transmission which give it excellent acceleration and all-weather traction. Notable standard equipment includes a 7.0-inch infotainment screen with full smartphone integration and safety systems include frontal collision mitigation and rollover protection. A full range of safety systems such as active lane assist and adaptive cruise control are available as well as an adaptive suspension and virtual cockpit, although most are only available in conjunction with the top Prestige trim level. 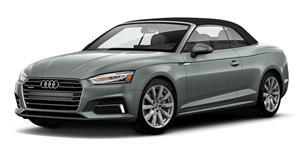 The Audi A5 Cabriolet has been completely redesigned for the 2018 model year, the exterior changes may seem subtle but the latest technology and safety systems are now part of the new package and there are a whole host of available options to further enhances this luxury sport convertibles desirability. 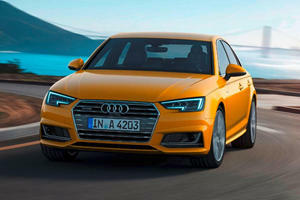 The redesigned interior is now in line with the rest of the latest Audis on the market and the minimalist design and high-quality finishes place the A5 near the top of its class. While it shares its interior design with the rest of the A5 range, the cabriolet offers slightly narrower rear accommodation and with the roof up there is limited headroom for taller passengers. The front seats are supportive and offer a range of adjustments to suit even taller drivers, extend the seats too far back and the rear legroom does become compromised. 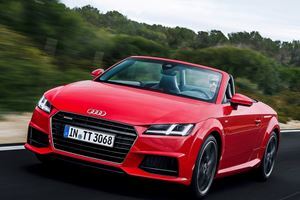 The trunk is not overly compromised for a convertible and while it is slightly smaller in capacity than the equivalent sedan, it is still generous. The A5 has always offered a sharp and capable driving experience, the redesigned model is now even more capable with a more forgiving suspension setup that tackles rough roads with ease and a revised all-wheel drive system that resists the tendency to understeer in all but the most extreme situations. The steering can feel a bit light at lower speeds but it responds immediately to inputs and the brakes too are extremely responsive giving you the confidence to push harder. The A5 cabriolet is well insulated from road noise with the roof up and other than tire roar the cabin remains quiet at highway speeds. 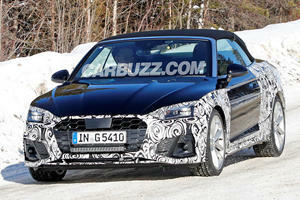 The A5 Cabriolet is fitted with Audi’s latest version of the 2.0-liter direct-injection turbocharged engine. In this application it provides 252 horsepower and 273 lb-ft of torque, quattro all-wheel drive and a 7-speed dual-clutch transmission are standard. Performance figures are competitive for the class with the 6.0-second 0-60 mph time a fraction ahead of the similarly powered BMW 430i x-Drive. The quick-shifting dual-clutch transmission responds well to driver inputs although a slight hesitation at low speeds can sometimes be felt. The A5 offers enhanced fuel efficiency over the outgoing model and it now offers 24mpg in city driving and 34mpg on the highway. There are three trim options to choose from. The base Premium trim offers a 7.0-inch infotainment display with rearview camera, smartphone and Bluetooth integration, leather interior, Xenon plus headlights with LED daytime running lights, auto headlights and wipers as well as heated exterior mirrors and windshield washer nozzles. The Audi Pre-Sense driver safety aid system is also part of this package and includes frontal collision warning and mitigation systems as well as rollover protection. Premium Plus trim adds full LED headlights, heated front seats with memory function on the driver’s side, advanced keyless start and additional safety systems include side assist, rear cross traffic assist and vehicle exit assist. Prestige trim includes all of the above and adds a virtual cockpit, head-up display with navigation and assistance information, Bang & Olufsen 19-speaker audio system, navigation plus with handwriting technology, parking system with top view camera system and a trial subscription to the Audi connect online services. A number of standalone options and packages can be fitted to lower trim levels such as the Luxury Package which adds ventilated front seats and neck-level heating or a Navigation package which, aside from the obvious, adds the virtual cockpit and larger infotainment screen. A Premium Trim only driver assistance package is also available and includes adaptive cruise control, active lane and high beam assist as well as traffic sign recognition. An adaptive suspension options is also unique to the Premium Trim models. The 2018 Audi A5 Cabriolet is once again competing for top honors in the luxury sports cabriolet class thanks to a thoroughly updated offering. Detail improvements in handling and performance are aided by a big leap in technology and modern safety systems. Basic specification levels are commendable although you will have to stretch to the top trim level to gain access to some of the more desirable available extras.